Soho is a brilliant hodgepodge of restaurants. You are spoiled for choice when you head there for a meal. There is a brilliant mixture of chain restaurants, small mom & pop establishments, specialist restaurants that feature European, traditional English, South American, Chinese, Japanese, South Asian and Middle Eastern cuisine. There are a variety of bars, coffee shops and patisseries as well. The question of what to eat becomes even more difficult to answer when faced with so much choice! One of the newer kids on the block featuring Southeast Asian cuisine is Bobby Chinn’s House of Ho. Found in the middle of Old Compton Street, the monotone gray facade of the restaurant contradicts the diverse flavours of the dishes that are on offer on the menu. Bobby Chinn describes the food on offer at House of Ho as “modern Vietnamese food and flavours.” I was mostly excited that it was Bobby Chinn’s restaurant. I was a bit of a fan of his when I lived in Manila. His cooking shows were an afternoon staple when I was at home and had access to TV. Apart from that, I love Vietnamese food. We had a Vietnamese lady stay with us once for a few weeks and she would cook us a proper Vietnamese meal once in a while. My favourite was a chicken recipe with lemongrass. I fell in love even more when I was introduced to pho and the fresh spring rolls (in Atlanta of all places!). Vietnamese food is one of the lesser known Southeast Asian cuisines, although it is now becoming more and more recognised (thanks in part to very popular street food purveyors of banh mi and pho), and Philippine cuisine, being a Southeast Asian country, the flavour bases are typically the same with Chinese, Malay, Indonesian, and Indian influences. 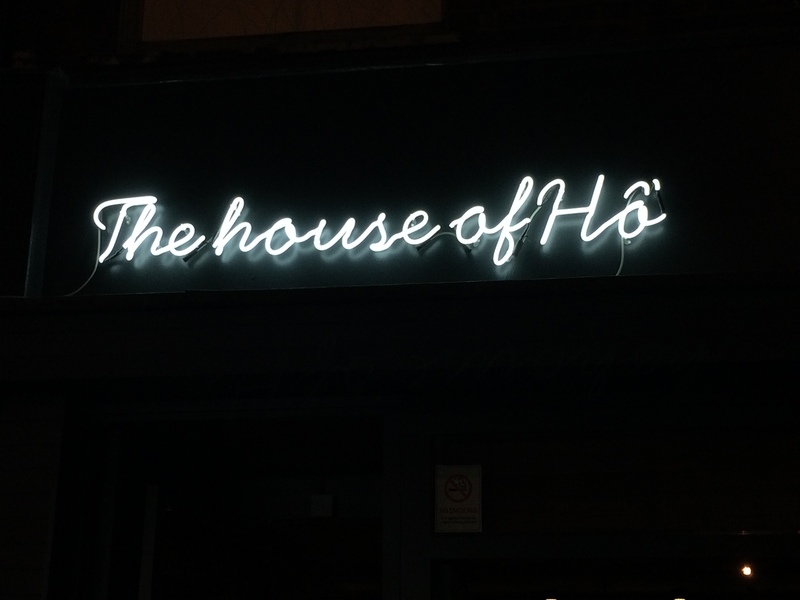 We walked past House of Ho around lunchtime. I recognised Bobby Chinn straightaway. He was sitting at a table, having lunch, by one of the large open windows of the restaurant. We crossed the street and looked at the menu and thought the prices were really good (I mean hey, it is a Bobby Chinn restaurant!). There were lovely things like spring rolls, morning glory (we call it kang kong in the Philippines) and sautéed choyote (we call it sayote in the Philippines) on the menu. It got me really excited! But what made my day was when we walked past Bobby Chinn, we said hello and we said we’d be back and he smiled at us, said hi and said that that would be great. It doesn’t take much to make me happy, but that made my day (insert fan girl wisecrack here!). 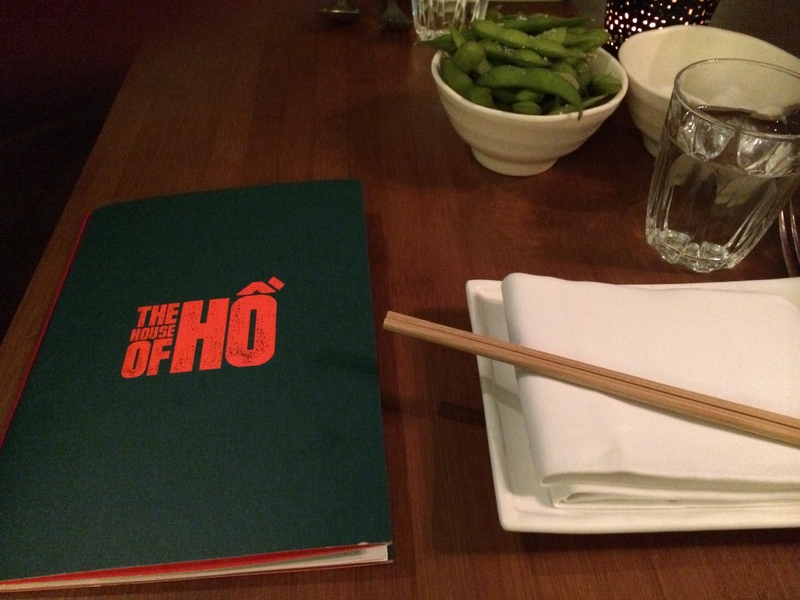 We decided on having dinner at the House of Ho. We’d been walking around London and were still quite full up from all the small bits of eating that we’d done throughout the day, so a light but late supper (we’d been to see The Commitments before deciding on dinner) was in order. As luck would have it, Mr Chinn was again in front, twiddling away on his mobile phone. I’m not entirely sure that he recognised us, but we did say we’re back as promised and he ushered us in and told one of the staff “They came back!” We were promptly seated into nice seats. The interior of the restaurant at night has subdued lighting and the seating is efficiently spaced – it only seats about 90 people apparently and while it does use space well, the seating isn’t cramped and you don’t feel like they’ve squashed as many seats as they could in the space that they had. There was breathing space. We chose edamame for nibbles, our usual sodas (diet for me) a bottle of water, a bowl of steamed rice to share, chicken Imperial rolls, chicken curry and apple smoked pork belly. Everything was great. I was a little taken aback by the portion sizes. Southeast Asian eating is mostly family eating size. So you get a big bowl of rice and a big bowl of your main dish or dishes. But that being said, even though the portions were smaller than expected, they were enough to share, so that you could get a taste of everything. I understood what Bobby Chinn was trying to do. He wanted to make the dishes look elegant (because let’s face it, family eating is about functionality and not elegance, not really) so that apart from the look, you could focus on the taste. And boy, did you get a taste! The rice came late, which was a bit of a disappointment (and on our bill, we were billed twice for it, but that was quickly changed with a lot of apologies, so that was okay!). Rice is ESSENTIAL in Southeast Asian dining. It comes first. The Imperial rolls were lovely. 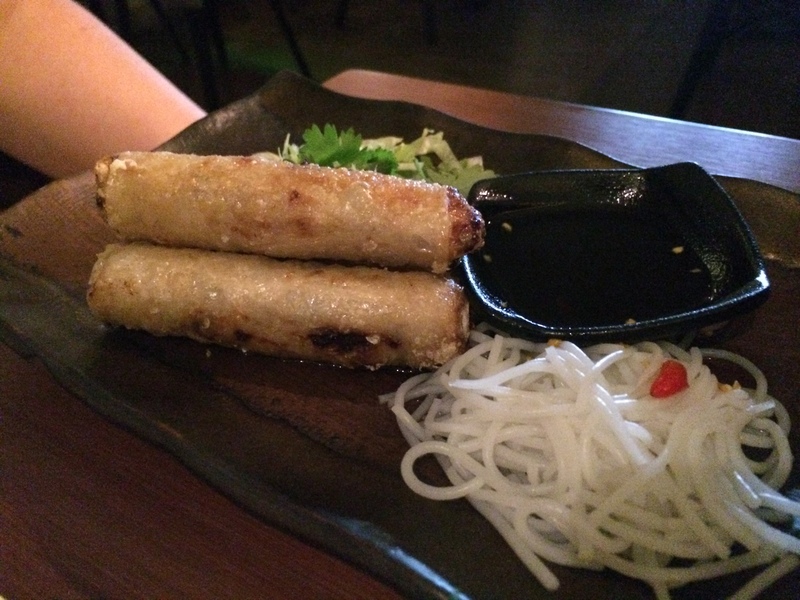 They were petit spring rolls, not like what the British are used to. In the Philippines we have a version that we call Lumpiang Shanghai (loom-pee-yang Shanghai). I’m not ashamed to say my yardstick for really (really) good cooking is my mum’s cooking. And the Imperial rolls pass muster. It’s up there in terms of taste compared to my mum’s lumpiang Shanghai. I was in spring roll heaven. 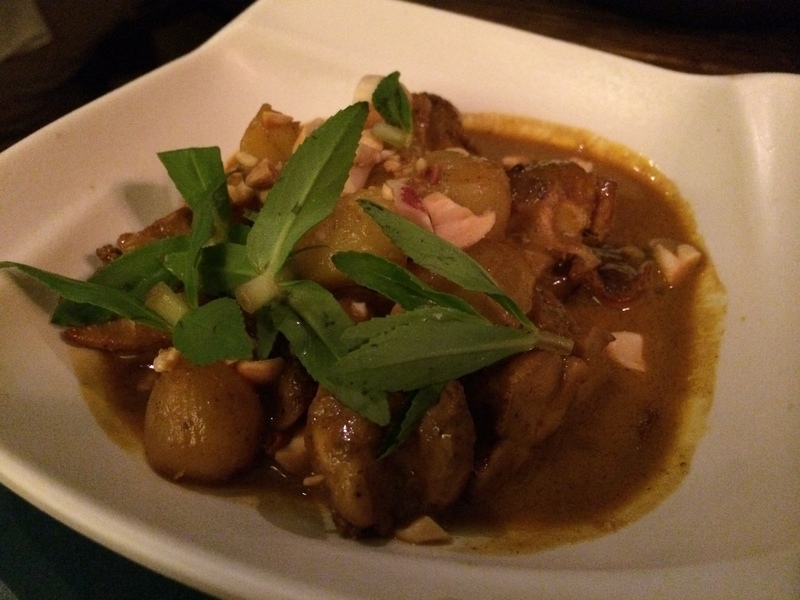 The chicken curry was probably one of the best chicken curries I’ve ever tasted. Everything was delicate and yet the flavour hit you. You knew you were eating chicken curry but you weren’t walloped into realising it. All the flavours just melded. I wanted to ask if the delicate green leaves on top were the paddy leaves because they were yummy. There was an amazing explosion of aniseedy flavour in your mouth when you included on of the sprigs. I would probably, very willingly, dive into a vat of that chicken curry. It was GOOD! 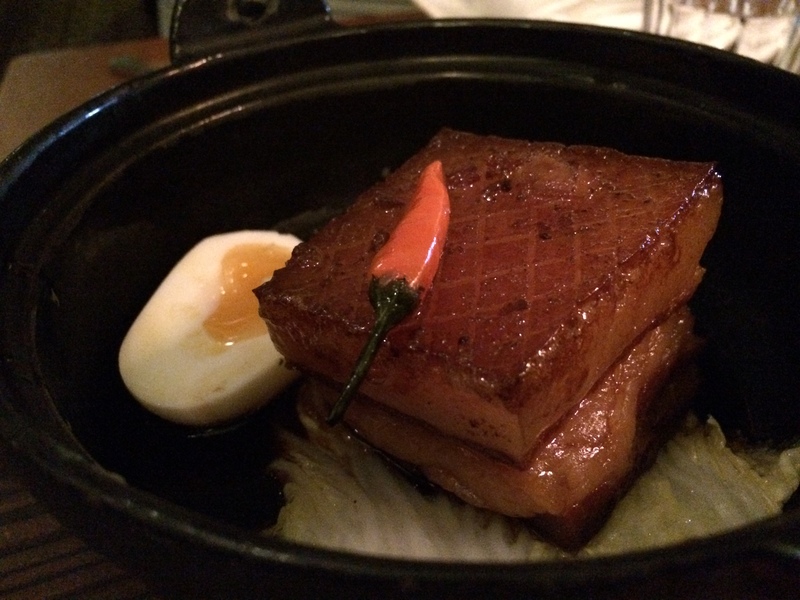 But the showstopper was the apple smoked pork belly. Oh. My. God. Wait. Let me gather my thoughts…That was the most amazing thing I’d ever tasted. Ever. Really. My mum has a pork dish that she calls Lutong Intsik (loo-tong in-chick) which translated means “cooked the Chinese way.” I think my mum used a pork shoulder joint and then braised the pork until it was meltingly soft. House of Ho’s belly pork dish was like. Only a thousand times better (sorry Mum!!!)! It was just too good. I know there was soy, there was probably some sort of sugar, there were spices. I can’t put into words how good it was. It was just an explosion of flavours in your mouth! I mean there was a party in my mouth and it was hosted by that beautiful belly pork. I think about the pork and I sigh. I don’t think I’m exaggerating when I say that it is probably the best thing I’ve ever had. It was really that good. If you go to House of Ho, if you order just one thing on the menu (rice doesn’t count because you have to have rice) you MUST order the belly pork! It is an experience in itself. But you must go, at least once, to House of Ho. The staff are great, the food is glorious and Bobby Chinn is a genius! Am already looking forward to my next trip! And yes, you can bet that I’m ordering that pork!